At the end of a sporting match, it is good to see good sportsmanship, as displayed by these beach soccer players. This looked like a pick-up game of tourists and locals, and they seemed to enjoy playing soccer with each other on the beach. But who needs a soccer field when the beach at low tide is wide enough to play soccer? This week we are showing photos of Nicaragua on our Viva la Voyage travel photo site, featuring the doorways of the Spanish Colonial old city of Grenada. Most Costa Rican towns have a soccer/football field right in the middle of town. In small towns,the field occupies what would ordinarily be the town square, and the church usually faces the soccer field. 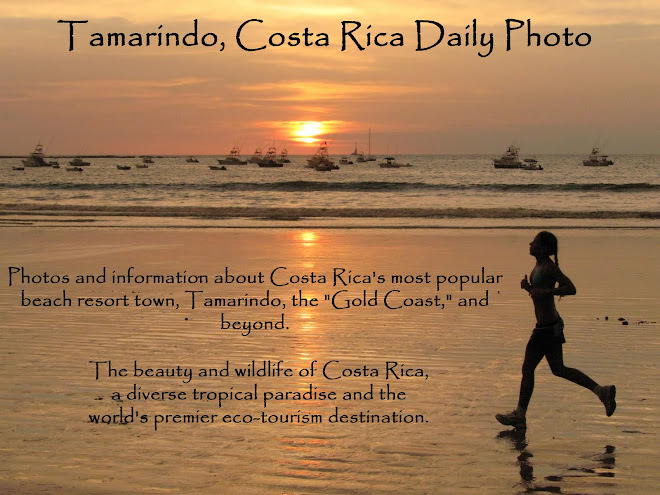 Tamarindo is not a typical Costa Rican town, as it is a beach resort where most of the people are foreigners and visitors. There is no soccer field in the middle of town. The beach will suffice. Lots of surf shops have diversify and offer more activities than surfing, as illustrated by this surf shop that caters to a lot of activities. Tamarindo is a place where you can be active, or you can relax and unwind. Julie and I prefer active vacations when we travel, but in Tamarindo we enjoy relaxing with walking on the beach, watching the sunsets from our balcony/patio, and then walking to dinner. We have a USA phone line in our condos, so we can work and be connected to the office and clients on our laptops while enjoying a tropical beach. The photos I have shown recently illustrate that Tamarindo is a surfing town. So it should be no surprise that there are lots of surf shops in town. Today's photo is a rather common sight. But there is more to do than surf, as I will show tomorrow. Langosta beach is a great place for surfing. A man from Barcelona who rented my Langosta Beach condo sent me a great photo of himself riding down the curl of a wave and said his week at our condo was "epic surfing." I don't surf, but I enjoy watching the surfers. Today's photo shows that at times they must be good not to run over each other, as there are 5 surfers in this photo, 2 caught the wave and 3 are getting ready to catch the next one. Today is Sunday, so we have new photos posted on our Viva la Voyage travel photo site. This week we are showing photos of Nicaragua, featuring the doorways of the Spanish Colonial old city of Grenada. 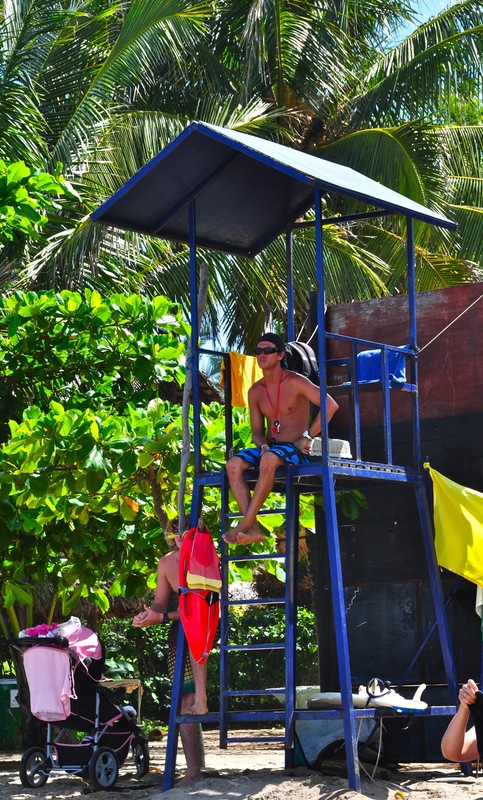 This is a lifeguard stand behind the Barcelo Langosta Beach Resort. Sometimes there is a lifeguard on duty, and sometimes there is not. 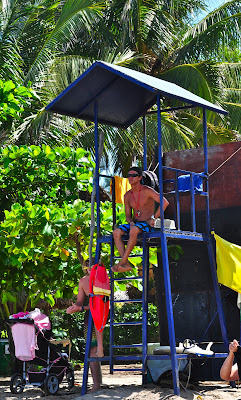 Being a lifeguard must be like being a fire fighter. You hope you never get called, but when you do, it can be crucial. This is a good spot for a lifeguard because the Langosta Estuary flows in and out near this location. When the tide is going out, it is best to stay to the side of the estuary mouth, as it is like a river flowing out to sea. I have walked across the estuary mouth but I do not swim in the ocean in front of the estuary when the tide is flowing out. It is best to stay to either side of the estuary mouth. This week we have photos of Africa posted on our Viva la Voyage travel photo site. The end of the day brings the soft colors of the setting sun bathing the beach, sky and sea. This is the heart of Tamarindo beach, with Cabo Velas across the bay to the south. It is no wonder they call our area of Costa Rica the "Gold Coast." These girls appear to be heading home, understandably choosing to walk along the beach rather than the street. An employee of the Tamarindo Diria resort is nearby, taking some of the resort's lounge chairs from the beach back up to the adjacent hotel grounds. Tomorrow the cycle will repeat itself, as predictable as the tide. No, the horseman who I showed yesterday was not smiling at me. He probably did not even notice that I was taking his photo. He was undoubtedly looking at someone who was walking down the main street of Tamarindo, after getting a cool drink and doing a little shopping. left a comment yesterday that correctly guessed why he was smiling. Bob also left a later comment saying that yesterday he saw this same guy with his horses in the middle of Tamarindo. Bob is staying at our condo in Playa Langosta this week, and a friend of his has rented the condo for next week. Bob is posting some superb photos of Tamarindo and Langosta on his site. I highly recommend that you check it out. Why is the horseman smiling? This is the same guy with 3 horses that I showed yesterday. It looks like he has 3 different sized horses. The smaller horses are probably for rides for children. But why does he have such a wide grin? Is he smiling at me? Does he think I will rent a horse to go riding? As usual, the answer will be shown tomorrow. It might make you smile. Here is another photo of horses sharing the road with vehicular traffic in Tamarindo. This is right in the middle of town. I assume that the horses are for rides by tourists. I will show a few more pleasant photos of these horses and the rider in the next two days. 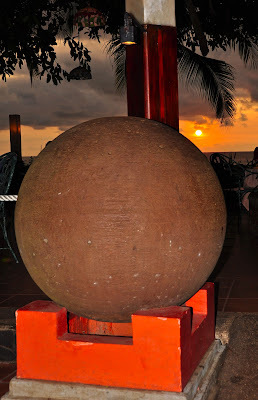 This is one of the giant stone balls the pre-Columbian cultures carved and that can be found at various locations around Costa Rica, which I have shown and written about in the past. You may remember the opening scene from the first Raiders of the Lost Arc movie, in which Indiana Jones runs from a giant stone ball in the jungle. Some places in Costa Rica preserve and display these stone balls as decorative items. There is one at the entrance drive to the airport in Liberia. The one in this photo is at the beachfront restaurant at the Tamarindo Diria Resort, which is a popular place to gather at sunset. 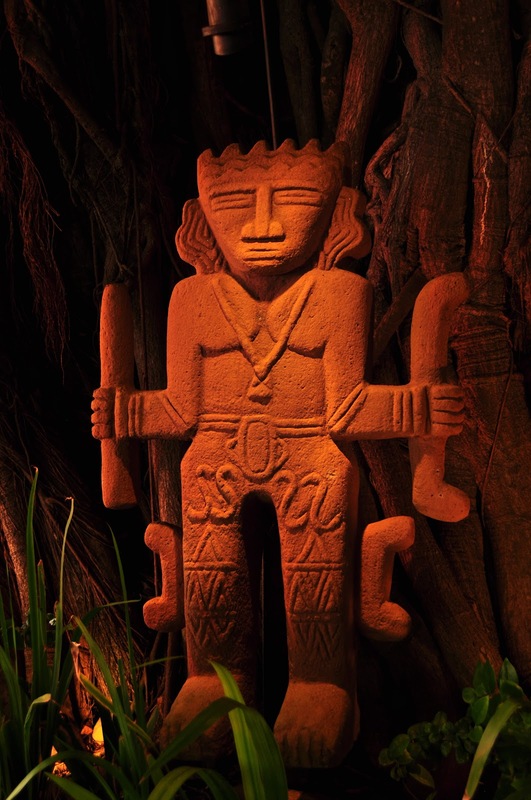 This is one of the stone statues on the grounds of the Tamarindo Diria Resort, where we have one of our two condos. The Diria uses this figure as its logo. It looks like some of the pre-Columbian figures in the museum in San Jose, so I presume that this design has its roots in the early native American culture of the area. Sadly, Costa Rica does not have a lot of Native American architecture or other relics of pre-Columbian culture. The indigenous population was nearly wiped out after Spanish colonization, victimized by European diseases and enslavement. Today is Sunday, so we have new photos posted on our Viva la Voyage travel photo site. This week we are showing some more photos of Africa. I have shown some beginning surfers recently on this website, so here is a more accomplished surfer, cutting between the curl of a breaking wave on Langosta Beach. This week we are showing photos featuring the people of Papua New Guinea on our Viva la Voyage travel photo site. Here is the last photo in my short series of the mother pulling and spinning her young son in the surf. Her child is barely visible in the spray and splash in this photo. I am sure he is having a great time and, therefore, so is she, enjoying his joy vicariously the way parents inevitably do. For Valentine's Day I thought I would show this couple holding hands while walking down Tamarindo beach. Maybe for Valentines Day this couple will decide to give each other the gift of another tattoo. After all, it appears that there are still some areas of skin available for more tattoos. She has a tattoo on her right leg, but not on her left leg. It looks like she has a tattoo on her left, well, er, you know, but not on her right one. I am not a fan of tattoos. I think I better not comment further on hers, however, for obvious reasons. This mother was expending effort to pul and spin her son across the water in the shallows of Tamarindo beach. I will conclude this little series the day after tomorrow, after an interlude for Valentine's Day with tomorrow's post. This young boy has it made. Who needs to master the art and expend the effort to ride a wave into shore when you have a mother who is willing and able to pull and spin him around. Tomorrow's photo will show that this scene gets even more fun. This photo is the same scene as yesterday, but the cowboy and his horses have to share the road with trucks. A scene like this is sad, but inevitable. It is not possible to have the shops, restaurants and commerce in Tamarindo with trucks driving there. Another example of the contrasts in Costa Rica was evident from a recent article in the newspaper. The police will now expect every driver in Costa Rica to have an email address. Notices of the amount of fines for violations will not be mailed to violators, but will b e sent by email only. If someone does not use email, they will have to watch for the publication of legal notices in the newspaper. Our area of Costa Rica is a land of contrasts. Tamarindo is a growing international beach resort, yet nearby are villages where people enjoy a rural farming and ranching lifestyle. Tomorrow I will show a wider view of this scene of a cowboy and horses on the side of the road that illustrates the contrast and changes in rural Costa Rica. On an unrelated subject, the Costa Rican newspaper had an article the other day that Cirque du Soleil is coming to do one of their shows in Costa Rica for the first time. I am sure it will be in San Jose. Julie and I love Cirque du Soleil. We have seen 5 of their Vegas shows (Mystere, O, Ka, Beatles' Love, and Zarkana) and their show at the Kodak Theater in Hollywood, as well as Cavalia, their traveling horse show. Today is Sunday, so we have new photos posted on our Viva la Voyage travel photo site. This week we are showing some more photos from our November trip to Papua New Guinea, featuring the people of Papua New Guinea. With a large snow storm battering the U.S. East Coast today, I thought I would post this photo of a tropical sunset for people who are snowbound in their houses to look at and day dream today. 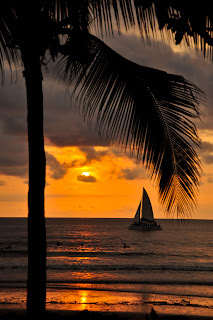 I took this photo from the beachfront restaurant at the Tamarindo Diria Resort, where we have one of our condos. There are several sailboats that do afternoon snorkeling excursions that return at sunset each day. The Diria Restaurant is a pleasant place to have a drink while waiting for the sunset, as the sail boats cross the horizon. This week we are showing photos of everyday life and the wildlife of Tanzania on our Viva la Voyage travel photo site. 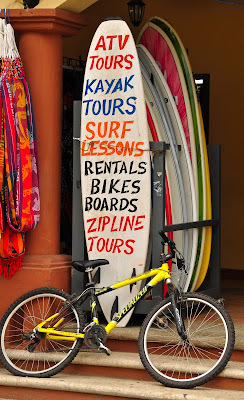 Commuting in Tamarindo for many people means the challenge of taking the surfboard out and back from the surf. At least there are no traffic lights. The puppy perched on a beach board acted, well, like a puppy. There was only one object on the beach board, and the puppy became curious about it. In this photo the puppy is sticking his nose into the ankle bracelet that is tethered to the beach board to prevent it from getting away from a rider when crashing in a wave. I am still trying to achieve a little gender equality by posting a few photos that would appeal to women, such as yesterday's photo of the guy surfer, after my series of photos of women surfing. So, I figured that a photo of a little puppy with a pink collar might appeal to my female readers. I think that this puppy was taking a little break on a boogie board to rest up from frolicking in the surf. I would think that the waves might be a little frightening to a dog this small. Long time readers of this blog know that I try to maintain some gender balance, so I figured that after my series of the women surfers lately, particularly because of the type of swimming suit the were wearing, I better show a photo that appeals to women. Tomorrow I will show another photo that I figure will appeal to women, but it is not a photo of a guy. "And how was your wave?" After these friends were surfing, with the photographer among them with her, well, er, her back to us, what did they do? These are women, so of course they had to talk to each other about it. I expect that this is sort of like men talking about their fishing, including the big fish that got away. Perhaps they are talking about the giant wave that they just missed riding in to shore. This photo was taken right in the heart of Tamarindo Beach. I like that there are still so many trees around. The tourist shops are on the beachfront road, just behind the row of trees, rather than cluttering the beach. All waves must come to an end. And I guess keeping one's balance becomes more difficult as the surfboard slows at the end of a ride. I will conclude this series tomorrow, and then will attempt a little gender balance. Today is Sunday, so we have new photos on our Viva la Voyage travel photo site. This week we are showing some scenes of both everyday life and wildlife of Tanzania. The beginning surfer was able to ride the wave in on her knees, but was not able to stand up, I am not criticizing, however, as I have never surfed, so she is better than me. Kelly of Kelly's Surf Shop in Tamrindo has told me that if I take one of their lessons he would guarantee that I wil be standing up and riding a wave durin gmy first lesson. I am not sure. Kelly places some of his clients who buy a surfing package to stay in my condo, so I always refer people to him. 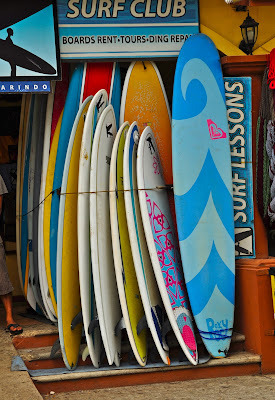 And where does Kelly come from that he would end up in the surfing business in Tamarindo? No, not Southern California. He is from Toronto. I am not quite finished with this series. We are showing photos of African wildlife this week on our Viva la Voyage travel photo site. Today's world wide Daily Photo Theme is "Umbrellas." My Tamarindo take on umbrella features the use of umbrellas to shelter and draw colorful attention to the merchandise of beach clothes outside this shop. Colorful swim trunks, hats, t-shirts and sandals are the wardrobe of choice for guys on the beach and around town. I have never seen a single person in Tamarindo wearing a suit and tie. This week we have photos of the wildlife of Africa posted on our Viva la Voyage travel photo site. To see how other Daily Photo bloggers have interpreted the theme of umbrellas, click on this link.